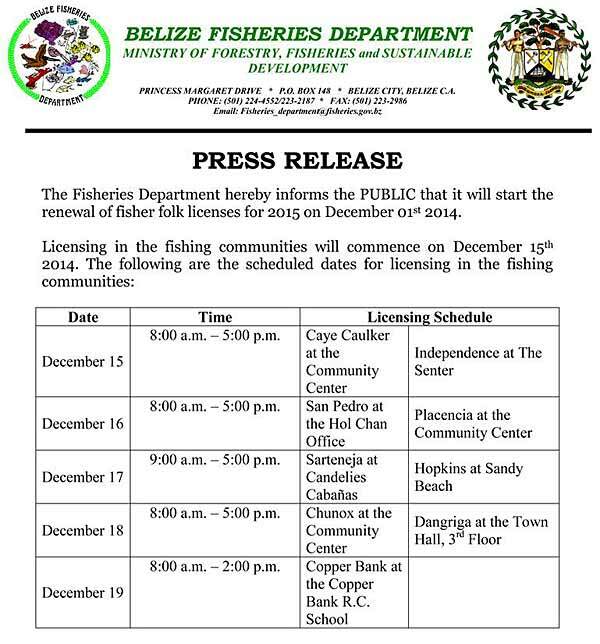 The Fisheries Department hereby informs the PUBLIC that it will start the renewal of fisher folk licenses for 2015 on December 01st 2014. *If no utility bill is available then the applicant is required to present the last three (3) months rental receipt and, an affidavit or letter from the landlord stating that the applicant is residing at his/her residence for the last three (3) months and this must be signed by a Justice of the Peace. **If the receipt is not in the name of the applicant, the person whose name appears on the receipt should authorize the applicant, in writing, to use the bill. The fisher must present the receipt issued by the Police Department or the report stating the loss of the license (Fisher folk or Boat License). Posted : Marty Casado - Fri, Nov 21, 2014 5:14 PM. This article has been viewed 8389 times.